You may have a table in Excel 2013 in which you need to perform a two-way lookup, whereby a piece of data is retrieved from the Lookup table based on looking up a value in the top row (with the table’s column headings) and a value in the first column (with the table’s row headings). The figure illustrates a situation in which you would use two values, the production date and the part number, to look up the expected production. In the 2013 Production Schedule table, the production dates for each part form the column headings in the first row of the table, and the part numbers form the row headings in its first column of the table. Use match_type 0 to find the first value that is exactly equal to the lookup_value. Note that the values in the lookup_array can be in any order when you use the 0 match_type argument. Use match_type –1 to find the smallest value that is greater than or equal to the lookup_value. Note that the values in the lookup_array must be placed in descending order when you use the –1 match_type argument. 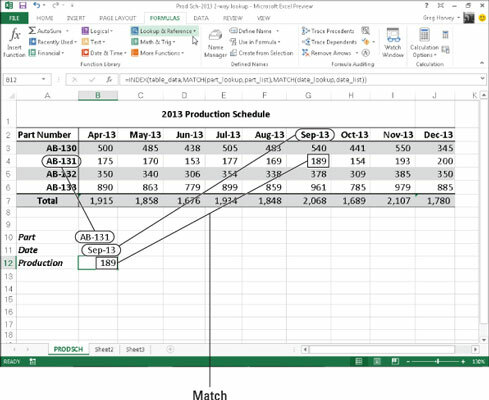 In addition to looking up the position of the production date and part number in the column and row headings in the Production Schedule table, you need to use an INDEX function, which uses the relative row and column number position to return the number to be produced from the table itself. The INDEX function follows two different syntax forms: array and reference. You use the array form when you want a value returned from the table (as you do in this example), and you use the reference form when you want a reference returned from the table. The array argument of the array form of the INDEX function is a range of cells or an array constant that you want Excel to use in the lookup. If this range or constant contains only one row or column, the corresponding row_num or col_num arguments are optional. If the range or array constant has more than one row or more than one column, and you specify both the row_num and the col_num arguments, Excel returns the value in the array argument that is located at the intersection of the row_num argument and the col_num argument.